Beyond black and white, native and alien, lies a vast and fertile field of human experience. It is here that Eric Liu, former speechwriter for President Clinton and noted political commentator, invites us to explore. In these compellingly candid essays, Liu reflects on his life as a second-generation Chinese American and reveals the shifting frames of ethnic identity. Finding himself unable to read a Chinese memorial book about his father's life, he looks critically at the cost of his own assimilation. 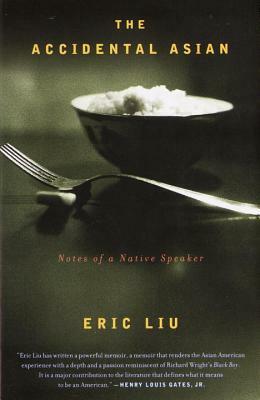 But he casts an equally questioning eye on the effort to sustain vast racial categories like “Asian American.” And as he surveys the rising anxiety about China's influence, Liu illuminates the space that Asians have always occupied in the American imagination. Reminiscent of the work of James Baldwin and its unwavering honesty, The Accidental Asian introduces a powerful and elegant voice into the discussion of what it means to be an American. Eric Liu is a fellow at the New America Foundation and a contributor to Slate and MSNBC. A former speechwriter for President Clinton, he founded The Next Progressive, an acclaimed journal of opinion, and edited the anthology Next: Young American Writers on the New Generation.